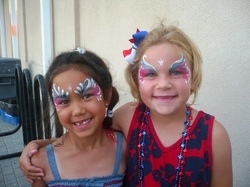 Face Painting is a great addition to any event! Speed varies according to your needs but for planning purposes, figure one hour per 10-12 guests for most parties, or 15-20/hour for large events, per painter. Requesting all full faces, or only cheek art will, of course, affect times. We can offer our most popular designs, a selection based on your theme or our full selection book, the choice is yours. We have a large selection of ideas for everyone! Remember to turn off your sprinklers before your backyard party! Request our pop-up canopy if shade is needed; no extra charge. Kids do line up and hang out around the table! We bring everything we need. Plan enough time for teens and adults to get painted ~ many do want to join in, and the photos are extra fun! Most babies and toddlers do not enjoy the experience; we usually try a quickie on the arm for them. Special themes and needs always accommodated - just ask!